Joseph Klausner (1900-1987) was born in Russia and immigrated to the U. S. in 1909. He was the founder of Klausner Supply Co. in 1944 after working as a carpenter, builder and plumber as a young man in New York City. He was the son of Samuel Klausner who first appears in city directories in 1916. Father and son appear in the 1920 U. S. Census living at 408 W. 50th St., Manhattan. Joseph Klausner, age 18, registered for the World War I draft in 1918 when he gave his occupation as "Student, High School of Commerce, 155 West 65th St.," and his address as 408 W. 50th St. In the 1925 New York State Census Klausner lived with his widowed mother, Rebecca Klausner, on Milford St. in Brooklyn. Then in the 1930 U. S. Census he lived with his wife, Bessie Klausner, on Creston Ave., the Bronx. By this time his occupation was "plumbing supplies." Joseph Klausner's naturalization petition, filed 7 October 1925, states that he was born 29 February 1900 in Woroshilofsky, Russia. He emigrated from Libau, Russia [Latvia], 17 December 1909, and arrived at the port of New York 27 December 1909 on the vessel Russia. "Woroshilofsky" is likely Voroshilovsky a district in the city of Volgograd, Russia. In 1921 Joseph Klausner was a member of the supply house of Miller, Spiro & Co., as announced in The Plumbers Trade Journal, vol. LXX, no 7, 1 April 1921, "The firm of Miller, Spiro & Co., established themselves at 2178 Amsterdam avenue, Manhattan, New York City, March 1st. A full line of plumbing and heating supplies will be carried. Herman Miller has previously carried on a successful plumbing supply business at 74 Manhattan street, and Irving Spiro and Joseph Klausner have formerly been connected with several New York supply houses. They have both worked on the inside and on the outside. They know just what the plumber wants, and are going to give him what he wants. The motto of the concern is going to be: "Quality, Service and Price." They have just purchased a 3 1/2-ton motor truck." The Miller, Spiro & Co. supply business, however, lasted only one year. As announced in The Plumbers Trade Journal, vol. LXXIII, no. 4, 15 August 1922, "Herman Miller has retired from the firm of Miller, Spiro & Co., 2178 Amsterdam avenue, Manhattan. Irving Spiro and Joseph Klausner have taken over all the affairs of the old firm, and will continue to do business, under the firm name and style of Spiro & Klausner. There will be no change, however, in the policy of conducting the business." Spiro & Klausner was established, then, in 1922 at 2178 Amsterdam Ave. This business moved to 2157 Amsterdam Ave. in 1925, then to 401 W. 124th St. in 1939. Spiro & Klausner shut down in 1943/44, and Joseph Klausner then went into business on his own at 224 W. 145th St. as the Klausner Supply Co.
As of December 2014 there were two Klausner locations in New York City, 1390 2nd Ave. and 905 Columbus Ave. The Klausner store above at 158 W. 83rd St. was in operation approximately 1978 to 2004. 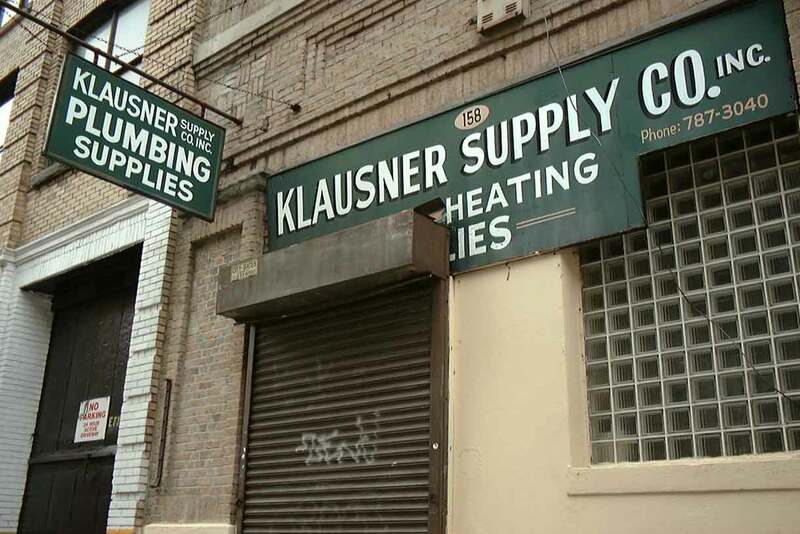 The earliest Klausner location was 222-224 W. 145th St. It opened in 1944. As of December 2014 Google Maps still showed a Klausner store at this location. A visit to the site at that time, however, showed it no longer existed.